Distribution: During their breeding season, bank swallows are found throughout most of North America from Canada to Texas. In California, there are approximately 115 breeding colonies, most of which are found along the Sacramento and Feather Rivers. Scattered breeding colonies also occur in several northeastern counties as well as Monterey, Mono, and Inyo Counties. 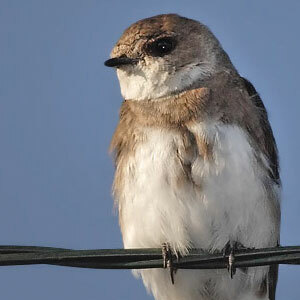 The Natomas Basin does not contain nesting habitat, but bank swallows from nearby nesting colonies in both Sutter and Sacramento Counties may occasionally forage in or travel through the basin. Habitat Requirements: In California bank swallows occur mainly in lowland areas along rivers, lakes, oceans, streams, and reservoirs that have vertical banks or cliffs of fine-textured, sandy soil in which they build nests. Bank height and pitch play critical roles in defense against terrestrial predators, and burrows serve both as nest sites and roosting shelters. Bank swallows conduct their aerial foraging mostly over water in riparian areas, various aquatic habitats, and wet croplands, but they can also be found foraging in neighboring brush lands. Roost sites include bank burrows, shoreline vegetation, logs, and telephone wires. Reproduction and Demography: Bank swallows form breeding colonies that contain anywhere from 5 to 1,000 nesting pairs. Each nest site typically consists of a tunnel dug horizontally up to 55 inches (140 centimeters) into the bank with a grass-lined nest chamber at the end. Four or five eggs are laid in April or May, with three or four surviving to reach fledging age. Most young have fledged by mid-July. The young do not leave the breeding grounds but remain with the adults along the riverbanks until fall migration. Movement: Bank swallows are neotropical migrants, arriving in California from Central and South America in late March through early May. Breeding colonies from the Central Valley begin their migration south starting in early August. Ecological Relationships: The bank swallow, the smallest swallow species in North America, feeds mainly on aerial and terrestrial soft-bodied invertebrates. While American kestrels and gopher snakes are their main predators, bank swallows and their eggs are also preyed upon by rats, skunks, house cats, and other snake species.